From California to Chile, France to New Zealand, the diverse climates all contribute to the varied flavors of this rich red wine trio. 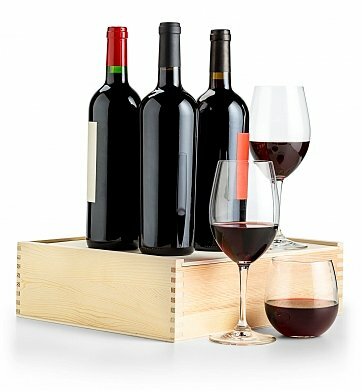 Ranging from berry-rich jam to eucalyptus and black pepper, your favorite red wine lover will be charmed by the surprising reveal of three lush reds from around the globe, presented in a custom wine crate. Three distinct bottles of Cabernet Sauvignon. Each bottle of wine is securely placed in our enduring wine crate. A complimentary card is included with your personal message. Sommelier's Red Wine Selection is a hand delivered gift. These gifts are delivered by one of our local design centers located throughout the United States and Canada. Same day delivery is available for most gifts when ordered before the cutoff time. The cutoff time for Sommelier's Red Wine Selection is 1 PM in the recipient's time zone. First Press Cabernet SauvignonDecadent chocolate notes and a bouquet of blackberry and mocha in a beguiling Napa Valley Cab. Novelty Hill Cabernet SauvignonDense with generous layers of ripe, dark fruit and a climactic finish. With a firm structure and remarkable balance, this wine offers aromas of blackberries and mocha followed by an array of black cherry, fig, and dark chocolate in the mouth. A trio of opulent red wines, each hand selected by the experienced sommeliers at GiftTree. Three sommelier-selected bottles of red wine, ranging in flavor profile. Arrives presentation-ready in our signature triple gift crate.